Pepsi vs. Coca-Cola. Universal Studios vs. Disney. Playstation vs. Xbox. Siteground vs. Bluehost. The great debates. (Fun fact, I prefer the first option in all of these examples. 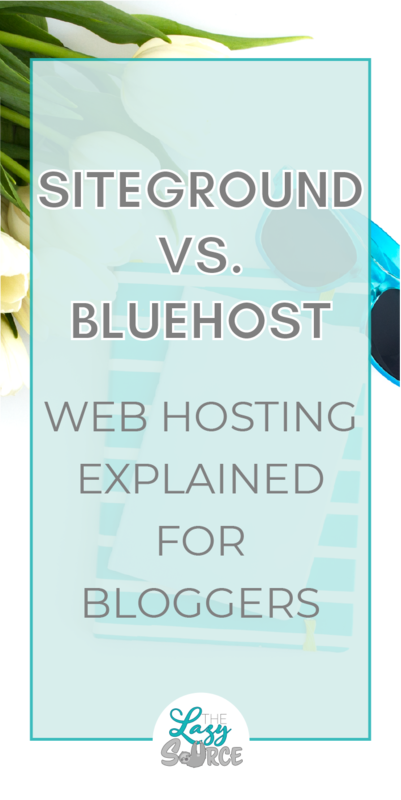 #unpopularopinions) If you've been researching blog hosting options, you've likely come across Siteground or Bluehost. If you're just beginning your blogging journey, you may still be confused about what hosting is. The best way I understand it is to think of a blog like a traditional business. An entrepreneur opening a store needs to find a building or commercial space that can house their business. Similarly, a web host houses your website. Your website's information is stored with this host. Your page loading speed is associated with your host. If your domain isn't on a web host's servers, people can't access your website. The web host owns the building, you're paying for a room. If you've ever had a bad landlord, you know how important it is to have a good one. Disclaimer: This article contains affiliate links, meaning that I receive compensation if you purchase through the links on this page (at no additional cost to you!). I preach transparency around here, so know that affiliate programs in no way affect my opinions of these products. I 100% believe in what I recommend. Update 8/8/18: This post was written when I was using WordPress hosted by Siteground. I have since switched to Squarespace and plan on creating an updated version of this post. For now, learn about why I made the switch here! It's worth noting that I still fully endorse WordPress & Siteground. Back to the great debate. Siteground and Bluehost are the two major players for blog-related hosting. I find that Bluehost is the most popular recommendation, especially with a quick Pinterest search. When I was first looking to start my blog, I honestly didn't realize bloggers used anything other than Bluehost. It's a well-loved staple in many income reports, and people can't stop recommending it. If you haven't figured it out already, you will soon: Bluehost has a very nice affiliate program. As such, it is a popular solution promoted by a gazillion bloggers. When I just happened to find a "How to Start a Blog" post promoting Siteground, I was baffled. And instantly overwhelmed. I barely understood what web hosting was, and the idea of having to compare companies stressed me out. It doesn't help that most hosting reviews are extensively technical. Talk about "in one ear and out the other". The one thing I knew about web hosting was that it was necessary. It's the foundation of your blog. If you sign up for a poor host, you're setting yourself up for a host of problems further down the line (haaaaa). So, I buckled down and did what I could to understand the reviews I read. I didn't understand site speed tests, or SSL certificates, or server hardware. Honestly, I still only have a surface level knowledge of these things. However, I learned enough. After all, you really only need to know a few basic items in order to make a solid choice for a blog. When the time comes that your blog's scale requires more in-depth optimization, you'll probably want to hire someone for that anyway. While I encourage you to read the rest of this post (I want you to know the why behind every business decision you make! ), I'll be the bad-friend and spoil the ending: Siteground is the winner! Let's clear up a few things before I continue. I am not a Bluehost affiliate. Bluehost has a nicer affiliate program than Siteground. But I still chose Siteground because my decision had nothing to do with affiliates. I barely knew what affiliate programs were when I chose a host. Bluehost is still a solid hosting decision. As you'll see in this post, independently, Bluehost will still provide you with what you need as a blogger. If you like what you've seen with Bluehost and believe your decision is informed, by all means, make your own choices for your business. However, when comparing cost, performance, and features, I believe that Siteground is a clear winner. What a blogger needs to look for in a host. This might be the most important concept to learn if you have hopes of making your blog more than a hobby. Many bloggers, myself included, start out on traditional hosted platforms such as Blogger or Tumblr. These are free to use and super quick and easy to set up. However, they're not ideal for a blogging business. Why? For one, you don't own your blog. You're just a renting tenant. They can kick you out any time they want. I read a horror story of someone who got flagged for spam (unjustly) and their blog was shut down for months "pending review." They were given their site back in the end, but by that point, they'd lost a ton of subscribers and traction with their blog. Secondly, you don't have much control. Sure, you can upload your own content and customize with certain themes, but you don't have true control over your website's design or functionality. You can't place ads (on some platforms, they'll force their own ads on your page, whether you want them or not), and you can't download plug-ins. Plug-ins are an entire universe by themselves, but trust me when I say, you're going to want them. Finally, you aren't as likely to rank on a Google search if you're on a free platform. Google will read it more like a profile page than an independent website, so you're going to struggle to get organic traffic to your blog. Smart business strategy focuses on scalability. If you want to build a high-traffic restaurant, you don't rent a closet just because it's cheaper. You find a space that has room for more tables and more people. Similarly, if you're serious about blogging, you're going to want a self-hosted solution so that you have ownership and control over your blog's future success. Your web host stores your site's information and does all the fancy technical stuff in the background. Your website software is like your control panel. It's how you design your website, add and manage content, create different website pages, and so very much more. WordPress is the most widely used software among bloggers, and the website itself boasts that 28% of the internet uses WordPress. Another advantage is that it's an open source software, which means thousands of people are improving it every day (Wikipedia is another example of a successful open source project). You definitely want a web host that is compatible with WordPress. Fortunately, (or unfortunately, if you're trying to make a decision) both Siteground and Bluehost are officially recommended by WordPress.org. Another thing to consider is storage capacity. Your website's information and content will take up storage space just like files do on your computer. The difference is, you're paying to take up space on someone else's servers. As such, many hosts will limit your storage space. Some blogs are photo or video heavy and will require more storage space. It's important to assess your own needs and factor this into your hosting decisions. Loading speed is a vital and often overlooked component of a successful website. Most people will back out of a web page if it takes longer than a couple seconds to load (data differs, so I'm generalizing for simplicity). Many web hosts do not have the best speed technology for sustaining growing websites. I've seen documented load times exceeding ten seconds! Sometimes well above! Trust me, you do not want your traffic to wait ten seconds to see your blog. You'll lose most of them before they can even see your post title. The ones who do stick around will have a poor first impression of your professionalism. Does anyone else have an irrational automatic door anxiety? I hate them. My greatest fear is walking up to one on my way into a store and looking like an idiot if it doesn't open. Seems ridiculous, but you know what? It happened to me. Even though it was the middle of the day and the store was clearly open. I stood there awkwardly looking in until someone else left the store and triggered it from the other side. To this day, I haven't been brave enough to go back. You know what else stinks? Clicking on a link to read an article that captured your interest, just to find that the site isn't working. Think online retail on Cyber Monday. Or Fandango just after the new Star Wars trailer came out. Crashed websites lose traffic and customers. You want a web host that can guarantee plenty of "uptime" and absolutely minimal "downtime." Did you know your website can get hacked just like any other online account? And when your website gets hacked, the damage can be catastrophic. This one's a no-brainer. You want a web host that can promise you up-to-date, top-notch security to prevent unauthorized access to your precious data. Along with this line of thinking, filtering out spammers is another priority. Having a solid, reliable, quick-response customer service team is so important to keep you sane. Honestly, you're almost guaranteed to need their help at least a few times. And if you've ever had to deal with crummy, outsourced, late-night customer "service," you know it's worth it to have just one good customer service experience. And last, but soooooooooo definitely not least, price! Web hosting is a cost that will not go away. For as long as you're running a blog, you're going to need to pay for hosting. This honestly goes without saying, but you want a reasonably priced host provider, for sure. Phew! Overwhelmed? I know, it's a lot. But now it's time for the most important part! Which host best fulfills these needs? I know I kinda spoiled it but let's just act surprised, okay? Note: Siteground offers the StartUp, GrowBig, and GoGeek plans. Bluehost offers a Basic, Plus, and Prime plan. I believe new bloggers should start off simple, so my comparisons will be between the StartUp and Basic plans. - Who are we dealing with? Bluehost is a well known, very large company that was founded in 2003 by a guy named Matt Heaton. Technically, he started pursuing the hosting industry in 1996, so you could argue that Bluehost's expertise has been around longer, but the official founding date is 2003. Siteground is a privately held company that is a relatively newer to the hosting industry. Many people see this as a disadvantage due to inexperience, but let me be straight up: they're technically only a year younger than Bluehost. One of the major differences between Siteground and Bluehost on a business level is the fact that Bluehost is owned by a much larger publicly traded corporation, EIG. I'm not one to criticize corporate America, but I have a touch of familiarity with corporate finance from college. General thoughts? A company like EIG that is acquisitions heavy (as in they own 60+ hosting companies) is not usually known for investing in things like customer support and convenience. They're a little more focused on the big picture for stock market performance. In fact, several reviewers have argued that EIG is known for overcrowding their servers (remember that room you're paying for? They just put three more people into your room and you all get to share). Basically, I've seen a lot of reports that service quality deteriorates after EIG acquires a company. - Can I use WordPress? There isn't a long version. How about a medium version? Basically, both Siteground and Bluehost are official WordPress recommended hosting providers. Plus, they both offer super easy WordPress installation. Honestly, it takes like 10seconds to install WordPress. Maybe not, I don't know what I'm saying. It's fast. - How much storage do I get? With Bluehost, you'll receive unlimited disk storage space, even with their basic plan. This is advantageous if you plan on uploading a lot of videos and photos with your content. When I say a lot, I mean it. Siteground's StartUp plan only offers 10 GB of storage space (their highest plan offers 30 GB). However, this is plenty for the vast majority of businesses to run a blog or website. - Will my website load? I'll be honest, if you try to Google the load speeds of different hosts, it gets mega-obnoxiously technical. I did this research like a week ago and it still gives me a headache to think about. So! Bluehost. From what I hear, not great. It's not uncommon to see people reporting load times between 10-30 seconds. Generally speaking, I really don't want to see a site take more than 2 or 3 seconds to load, and most people consider even that to be too slow. Siteground boasts a healthy arsenal of speed technology that increases their site speeds. One reviewer found their pages load at an average of 1.3 seconds. There's a lot of technical equipment stuff listed, and most of it is a load of nonsense us lazy people will never understand. Just know it makes it go faster. One feature I do understand is the use of Solid State Drives (SSDs). Siteground uses SSDs for all users, which is a major reason for increased speeds. The main reason for this is that SSDs store and access information on microchips. This isn't exactly scientific research, but when I search for "Bluehost slow" on Twitter, I was scrolling for several minutes before I got bored. "Siteground slow" only had 7 tweets, and one was an "is your web host slow? Switch to Siteground!" tweet. - Will my website work? Both Siteground and Bluehost boast 99.9% uptime. Many reviewers report experiencing 100% uptimes with Siteground in a year, and I don't know that I've seen any reporting less than the guaranteed amount. I didn't find many of those when I searched Siteground's hashtag post-2010. - How secure will my site be? Site security is also an extremely technical concept, but it's super important. I don't know about you, but I want to know that my information is being stored securely and is being monitored for suspicious activity. One security feature involves SSL Certificates. I didn't know what these were until recently, but one definition I saw described them as your website's passport or driver's license. They secure and validate your website's data, and can make your site more trustworthy to your visitors. Both Siteground and Bluehost offer free SSL Certificates. Bluehost offers security features mostly through paid add-ons and several options for automatic backups of your site. Siteground offers constant security updates, scans, and other security features for free. They also offer options for backups of your site. - Will they help me? Customer support is very important when you're dealing with something highly technical. As we all know, the more responsibilities technology has, the more things that can go wrong. Ever needed a printer to work just before a deadline? Yeah, you know how they betray you. On the flip side, I see a bunch of positive reviews for Siteground's super fast customer support response time. Additionally, their staff seems to be known for having exceptionally far-reaching levels of expertise in anything hosting-related. Bluehost reps don't have the same reputation, at all. I decided to also address a convenient service under this category. If you've already signed up for a different host and are wanting to switch to a new one, you need to look into the migration of your website. That is, if you'd like to keep all of your website data. Siteground offers a free one-time service for this. They will completely migrate your entire website for you, within 24 hours (many people report it getting done within 4-5 hours). They also promise that your website will not experience any downtime while they do it! Bluehost offers the same service (for five sites instead of one), but it'll cost you $149.99. Speaking of cost, we're finally at the best (and last) part! Let's clear up something super important here. You've likely seen by now a lot of promotions claiming that you can sign up for hosting for $2.95 or $3.95 a month. That sounds awesome, right? It's all a lie. Want to get that $3.95 rate with Bluehost? Surprise, you have to pay for 36 months up front. On the bright side, both websites offer a 30-day money back guarantee. Also of note, Bluehost offers you a free domain name for one year. You have to pay $14.95 for a domain with Siteground, or you can transfer in one that you purchased somewhere else. If you made it this far, you are truly dedicated to starting your blog off right. I respect that. I really hope I was able to clear up some aspects of blog hosting for you! I've littered links to Siteground all over this post, but if you hadn't yet decided, let me ease your mind. I don't know the story behind this Tweet. I don't know if he was having a bad experience or what was going on. All I know is, when I saw this, I kind of chuckled a bit. What was he expecting? Yes, you want the load speeds to be good. You want customer service to be helpful. You want setting up to be a breeze. But really, if you've never had a host before, you're not going to know the difference. I said in the beginning of this post that Bluehost is still a good standalone. I'd be nervous about all the performance complaints I see all over social media, but some people have really good experiences with them, honest. Hosting is tremendously behind-the-scenes. Most days, you probably won't even think about your host. They're probably not going to "wow" you. That's not their job. Their job is to keep things running in the background. If you notice your site's performance, chances are, they're not doing their job. And that's what I've enjoyed about Siteground. I haven't noticed any issues. Once I signed up, I installed what I needed to and moved on. I haven't had to think about my hosting solution since I paid for it. It's doing its job, I'm doing mine, and we're all happy. Wanna be happy too? I truly believe you can't go wrong with Siteground. Do you like the nitty gritty technical jargon? Did you make a mistake with your blog host? How to use Siteground's migration service. How to transfer multiple sites with a full cpanel backup.